The walls of Viterbo were built between the XIth and the XIIIth century; they surrounded three hills, the southern one being the site of the Cathedral. In order to strengthen the fortifications of the town some towers were built at key locations outside the walls. Torre della Bella Galliana was built in 1296 by Corrado Branca who was podestà of Viterbo; podestà were the chief magistrates in many medieval Italian towns; usually they came from another town in order to ensure their impartiality; Torre della Bella Galliana protected the access to Porta di Valle (more on Bella Galliana in page four). 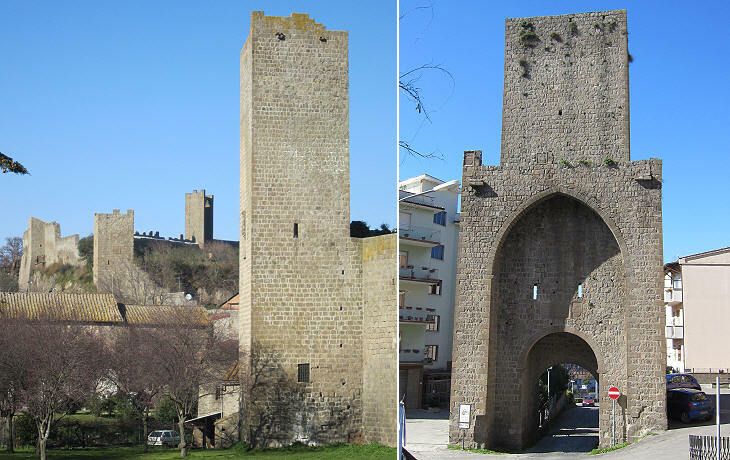 Torre Biele is a massive construction near Porta Romana; it was built in 1270 as part of an enlargement of the walls at the height of Viterbo's development; the original name of the gate was Porta di S. Michele. 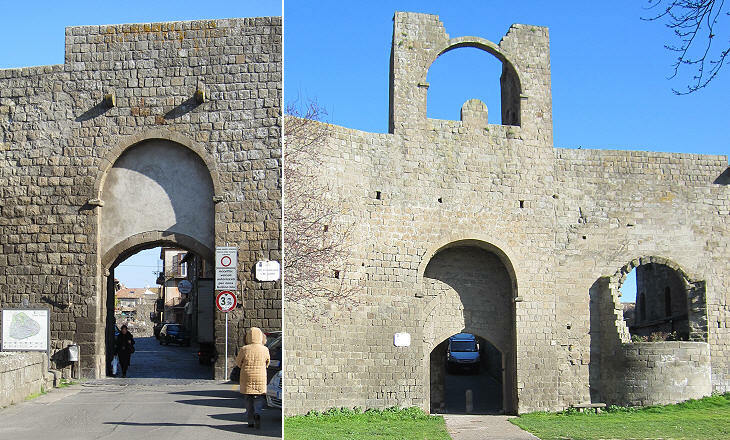 These two gates retain their medieval aspect; Porta di Valle was closed in 1568 when a new gate (Porta di Faul) was opened a short distance away; the two gates retain the upper structure from which an additional vertical door was lowered in case of attack. This gate was protected by a small castle which was turned into a more elegant residence by Cardinal Francesco Piccolomini (Pope Pius III for 26 days in 1503). The palace was eventually acquired by Donna Olimpia Maidalchini, sister-in-law of Pope Innocent X, who lived in nearby S. Martino al Cimino. 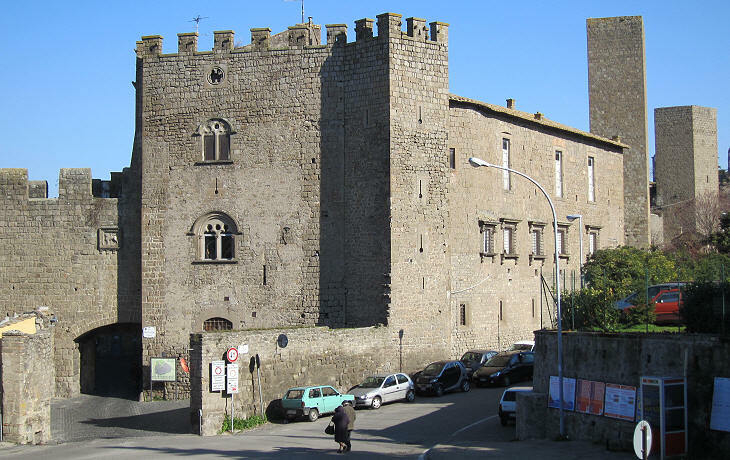 The Farnese, the family of Pope Paul III came from Canino, a small town between Viterbo and the sea and they acquired many fiefdoms which practically surrounded Viterbo. 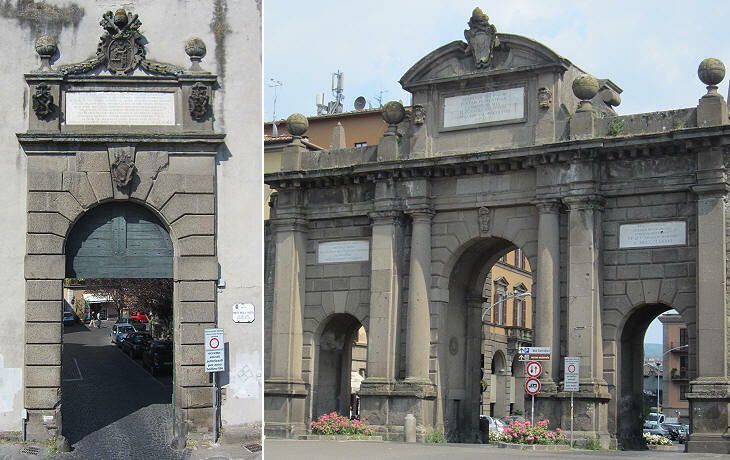 Cardinal Alessandro Farnese, grandson of the pope, opened Porta di Faul in 1568; the gate was officially named Porta Farnesiana but because it gave access to a depression called Faul between the hill of the Cathedral and that of SS. Trinità (see page four), the official name was soon forgotten. Porta Romana is the most important gate of Viterbo because it is the entrance to town for those who arrive from Rome; it was opened in 1643 when it replaced a smaller gate inside a tower and it was decorated for the 1650 Jubilee Year; it was redesigned in 1705 and for this reason it bears the coats of arms of two popes; the statue at the top of the gate portrays St. Rose of Viterbo, the patron saint; each year on September 3 Macchina di Santa Rosa, a sort of bell tower, is carried through the streets of Viterbo to celebrate the saint (see the website of the brotherhood - external link - for some galleries of images). Porta della Verità (Truth) has this name because it was located opposite S. Maria della Verità, a church outside the walls; the gate was redesigned in 1728 and decorated with the coat of arms of the reigning pope (Benedict XIII). 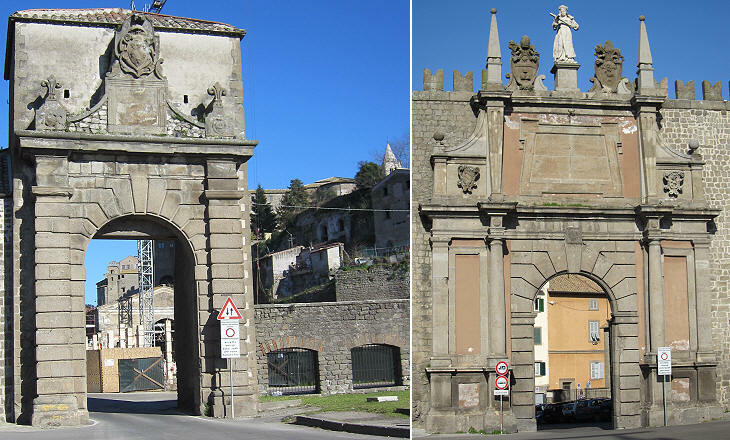 Porta Fiorentina is the last historical gate of Viterbo; it was built in 1768 and it replaced a previous gate; also in this case it was decorated with the coat of arms of the reigning pope (Clement XIII); two side openings were added in the late XIXth century. 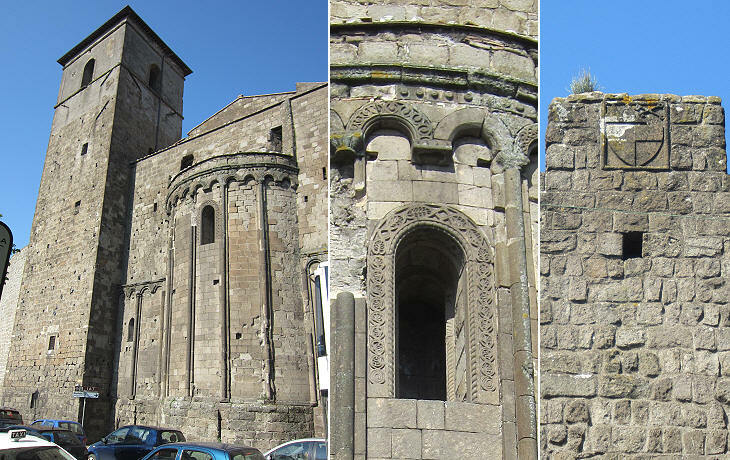 The apse of S. Sisto was spared by the 1944 bombings which destroyed the façade; the apse was built at the beginning of the XIIIth century and although it was visible only from outside the walls it was finely decorated. A very short section of the walls is decorated with coats of arms very similar to those on the loggia of the Papal Palace. 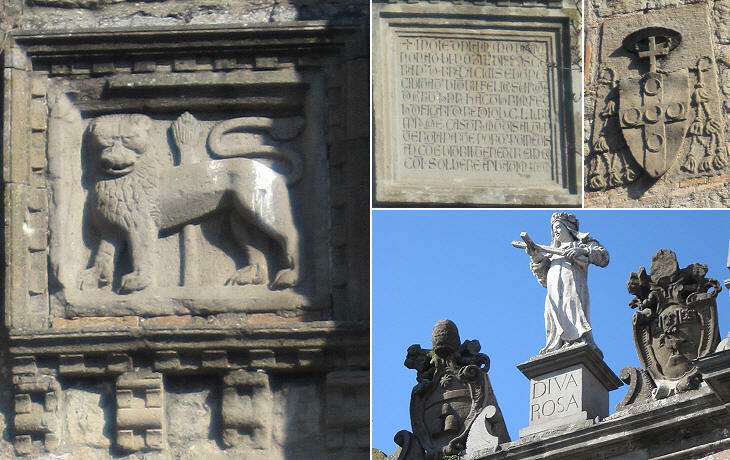 The lion in the coat of arms of Viterbo is a symbol of the Guelph faction (supporters of the pope) and perhaps also a reference to Hercules to whom a temple was dedicated in antiquity. 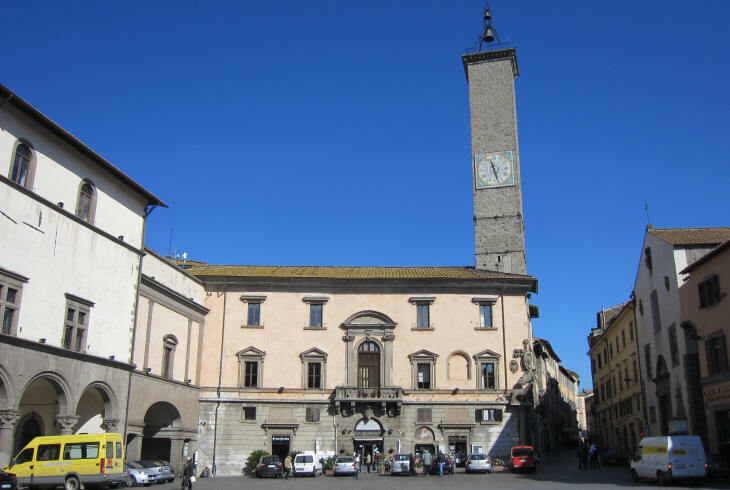 The palm was the symbol of Ferento, a rival town north of Viterbo which was conquered and destroyed in 1172. 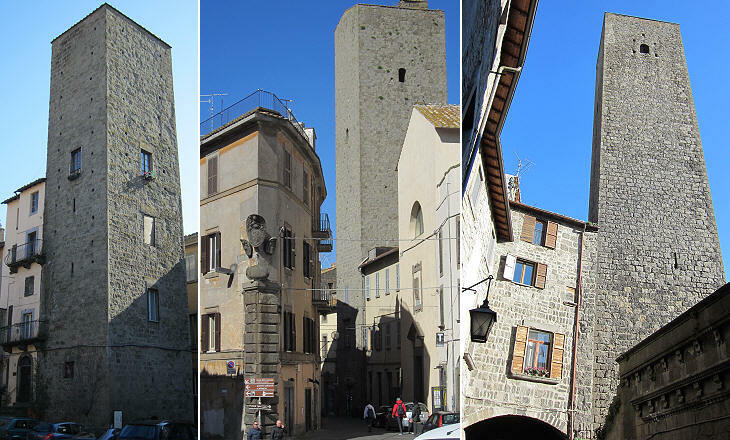 While the towers along or outside the walls protected Viterbo from external attacks, its inhabitants built many towers to protect themselves from their fellow citizens; several of them can still be seen by wandering about especially in the southern section of the town which best retains its medieval aspect.